Numerous activist-driven “studies” have suggested fracking poses a threat to the health of children, despite having no evidence to support those claims. EID recently debunked the latest attempts here and here. So it’s notable that the United Nations Children’s Fund (UNICEF) has just released a report highlighting the real threat to children worldwide — air pollution — and its data actually provides evidence that fracking has helped save children’s lives. 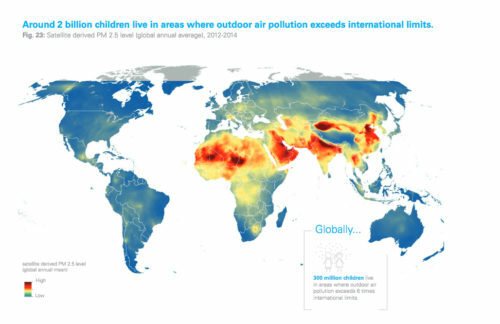 The report finds that in 2012 an estimated 600,000 children worldwide, mostly in developing countries, have died before the age of 5 from illnesses stemming from bad air related to both indoor and outdoor sources. The report notes this pollution has contributed to increased rates of asthma, low birth weight, cancer, birth defects and premature death — basically all the things fracking opponents have tried (and failed) to link to shale development. Yet the country with the least air pollution-related deaths is the United States – the number one oil and gas producer in the world. Of course, that’s because natural gas use has drastically reduced U.S. greenhouse gas emissions and pollution since the shale revolution began. 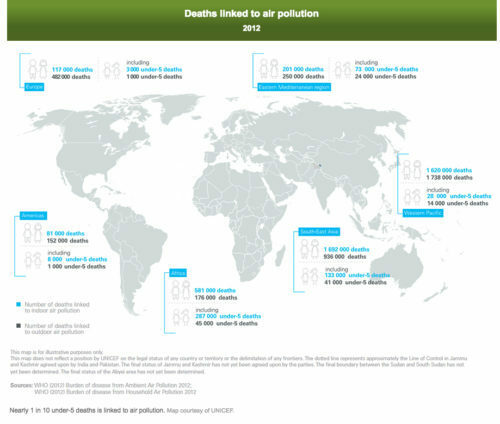 As the graphic from the report below shows, the “Americas” region that includes the U.S. has by far the lowest rate of deaths linked to air pollution, and would no doubt be even lower if the U.S. weren’t grouped in with developing countries in Central and South America. Also, the three most dangerous criteria pollutants cited in the study — fine particulate matter, nitrogen oxide and sulfur dioxide — are all in rapid decline in the U.S. thanks to increased natural gas use for electrical generation. Here is a quick look about what the report says about each. According to the latest U.S. Environmental Protection Agency (EPA) Greenhouse Gas Inventory, PM 2.5 declined 60 percent in the U.S. from 2005 to 2013. As the following graphic from the report shows, it is much the opposite story in the rest of the world, as PM 2.5 pollution is a huge problem in Asia and Africa. Natural gas emits virtually no sulfur dioxide, and thanks to increased use of the fuel, U.S. SO2 emissions have declined 78 percent since 1990 and 68 percent since 2005. Natural gas happens to emit one-third the nitrogen oxide as coal, so it’s no wonder NOx emissions have declined 38 percent since 2005 and 52 percent since 1990. The report notes that NOx combines with volatiles organic compounds to form ground-level ozone. Publicly available information demonstrates oil and gas production is not the significant contributor to ozone levels, as oil and gas activities account for just six percent of total NOx emissions according to the latest EPA Greenhouse Gas Inventory and emissions, and NOx and VOC emissions continue to decline thanks to increased natural gas use. And fortunately, U.S. air pollution could be positioned to decrease even more in the coming years. For the first time ever, the U.S. Energy Information Administration (EIA) projects natural gas to be the No. 1 fuel source for electrical generation for 2016, projecting it will make up 34 percent of the total fuel mix. The latter noted, the potential for natural gas’ share of the fuel mix to grow even further seems likely, considering its abundant supply and subsequent low costs going forward. The health benefits of this continued trend could be remarkable. A recent Carnegie Mellon study found that a complete switch from coal to natural gas would result in a further SO2 reductions of 90 percent and 60 percent for NOx, reducing national annual health damages by $20-$50 billion annually. Often taken for granted is the fact that abundant supplies of natural gas also reduce indoor air pollution, which the UNICEF report notes is even deadlier than outdoor pollution. Anti-fracking activists continue to release reports suggesting fracking threatens children by causing low birth weight, cancer, premature death, asthma and birth defects. Each of these studies lacks one key ingredient: proof. As the UNICEF report makes crystal clear, air pollution can and does cause all of these issues, making it a real threat to children. That’s why increased natural gas use made possible by fracking is a real solution.